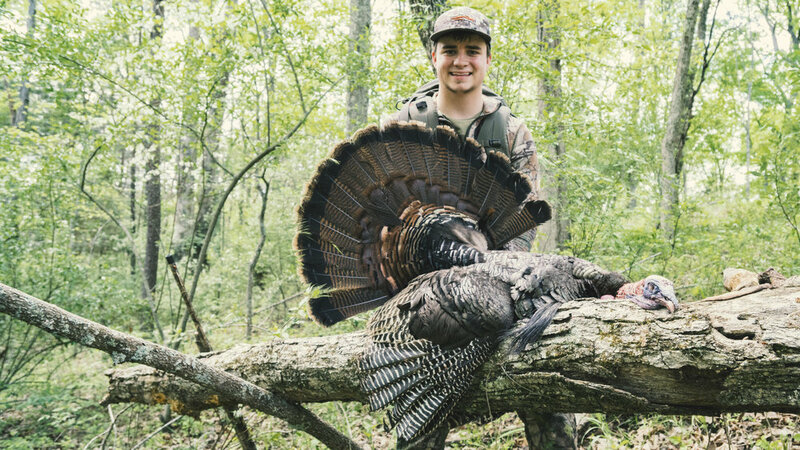 Now that you know The Untamed a little bit better, and if you don’t click here to read our Q&A with them, let’s talk about one of their passions - chasing spring gobblers. We had to opportunity to ask each member of the crew some of our most contemplated turkey topics, that we are sure you are curious about as well. Here is a look inside of our conversation regarding the chase of spring turkeys. Briefly tell us about the first turkey you ever harvested. What was it like? Josh Ilderton - I had just gotten out of the Marine Corps and met a great friend of mine now, Keith Alfrey, and we really hit it off. We had been hunting hard several days with a few close encounters but I didn’t close the door on any of them. We stayed after it that season and Keith called a stubborn bird in for me and I let the lead fly. It was awesome! I was hooked from that point! Kirk Price - The first turkey I harvested was with the person that really introduced me to turkey hunting, Chris Adkins. We were in Kentucky for their season opener and I had missed a turkey the first morning of the hunt. Being young and inexperienced, he reassured me that I would get another opportunity. Later that evening, Chris called in a bird for me and I successfully harvested my first long beard. Trace Butcher - The first turkey I harvested was with my older brother Ryan Butcher. It was youth day in West Virginia and before daylight broke he had walked me a couple hundred yards to the ridge top where he had roosted a bird the evening before. Shortly after daylight he called it right in my lap and I had my first turkey! Jay Cox - I killed my first turkey when I was 15. It was my first time ever going and all I really had to do was shoot. I didn’t know anything about turkey hunting but my cousin Jeff was already a master at it. He called 4 strutting and gobbling toms into 25 yds and I shot. It was love at first gobble. What are your best strategies behind using decoys? Josh Ilderton - I like using decoys at all sets unless the bird is just coming to fast or is too close to set them up. Depending on the time of the season, and what the turkeys are telling me, most of the time I setup a jake decoy with a hen or I will set out a single jake or a single hen. Kirk Price - I prefer to use decoys in open fields and in areas they can be seen for a long way. When a gobbler is closing in and he sees the decoy, often times he will lock in on the decoy and give you an opportunity to get a shot off. The biggest thing to remember is to make sure the decoy will be visible to the bird by placing it on the hump or roll of a hill. Using a decoy can be the difference between a bird hanging up just out of range or him coming in close for a shot opportunity. Jay Cox - I like setting out my Avian X Jake and breeding hen to get the gobbler looking for a fight. I’ve killed turkeys due to a good decoy setup over my average calling ability. What call would you suggest for new turkey hunters? Why? Josh Ilderton - All calls take practice, even for seasoned turkey hunters but I think a basic slate call is a great start. The slate call can make every sound that a beginner hunt needs to make to harvest his/her first turkey. But the key is to practice, practice, practice. Kirk Price - I would recommend a pot call or box call for a beginner turkey hunter. They are relatively easy to use with minimal practice but are extremely effective. Trace Butcher - I would recommend a box call for a new turkey hunter. They are easy to use but I would also recommend picking up a few mouths calls to start practicing. Find what call works best for you. Jay Cox - Get a slate call and practice, practice, practice. I really like the Woodhaven Cherry Classic Crystal. It’s easy to run and sounds sweet! If you could give one piece of advice to a hunter looking to harvest their first turkey, what would it be? Josh Ilderton - Hang in there like a hair in a biscuit! You will make mistakes, there will be missed, hens will take your future first turkey harvest away but consistency and hard work will prevail. Kirk Price - The piece of advice I would give to a new turkey hunter is find someone that is experienced and ask to tag along. Unlike deer hunting, you rarely just “get lucky” with turkey hunting. It can be tricky to figure out when to call, when not to call and where to set up. An experienced turkey hunter can teach you these things at a much quicker rate than you figuring it out on your own. Trace Butcher - One piece of advice I wish someone would have gave me is to stay patient and don’t call every time he gobbles. It keeps him interested and curious about you “the hen” when you play hard to get. Jay Cox - Find someone with experience and ask them to take you hunting. I learned from watching and listening to guys that knew what they were doing. If you could go on a turkey hunt with anyone, dead or alive, who would it be? Josh Ilderton - My son, Brody. I can’t wait to take him on his first turkey hunt. I love seeing his reactions when deer hunting so I know he will get excited hearing a tom thundering coming in hot! Kirk Price - If I could turkey hunt with anyone, it would be the people I turkey hunt with now. I love sharing my spring mornings with friends and family in the outdoors. Trace Butcher - If I could turkey hunt with anyone it would be my Grandpa. The stories he has told me from when he was a young man have really played a huge role in my life. I would have loved to have made a memory in the woods with him. Jay Cox - That’s a tough one for me to answer. One of the best things about turkey hunting is getting to hunt with different people and learning something new from each of them. I’ve learned the most from hunting with guys like Jeff Cox, Bryan Delamater, and Mark Scroggins. If I had to pick one guy though, it would be my Dad. I know one day we will have our last hunt together and I’ll want one more with him more than anyone. Now that you have some insight to common turkey hunting questions, and a knowledgeable channel to reference, it’s time to go chase some spring gobblers. Make sure you connect with The Untamed on Instagram and YouTube to stay up to date on their season, and what they are learning along the way. You won’t be sorry.